It takes a lot of effort to bring in new donors. That’s why hanging on to the donors you have—and getting them to donate again and again—is key for any nonprofit. So how you do you increase your pool of repeat donors? Here are a few rules to get you there. Rule 1: Remember, you’re only as good as your last interaction. The interaction a donor will remember most is the last one they had with your organization, so offer the best service possible at all times to all of your donors. Make sure you keep the donation process easy and streamlined. Acknowledge donations in a timely fashion and don’t keep donors waiting for promised tax documentation. Small donations can lead to larger ones down the line. Are you looking for products or supplies? Offer a “trial donation” where the donor only commits to a small amount. If that goes well, you can contact them to see if they would like to make a larger donation. Rule 3: Spread good will. Give donors the chance to piggyback on your public relations efforts. Sure, you may publicize their name in your lists of donors, but consider going one step further. Ask if they would like to talk about their donations in your press releases or promotional materials. Rule 4: Ask for feedback and follow through. It’s a good idea to send out surveys to your clients to ask about how the donation process went for them. Keep it short to increase your chance of receiving a response, and consider 10 percent a good return rate. Make sure you designate someone to go through the surveys and notify staff of any problems they need to address. 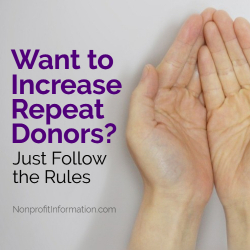 Rule 5: Honor your donors’ preferred form of communication. To develop positive relationships with donors, nothing beats in-person meetings with telephone conversations the next best. But taking those steps can backfire if a donor prefers you contact them only by email. Find out how your donors prefer you contact them, and then honor that request. If you’re receiving product donations, set up a schedule for how frequently you should contact a business. Some companies may want to donate on a quarterly basis, others every six months. It’s best to set those parameters up front. Rule 6: Remember to ask the next question. If you call and a company says they have nothing to donate at that time, ask if you can call back in six months. A lot of companies have “gatekeepers,” so if you call in six months and tell the person answering the phone, “Joe asked me to call him back,” your call is more likely to go through. And if you’re lucky enough to schedule an in-person meeting with a potential donor, remember the next question you should ask is whether anyone else would like to join you for the meeting. The more people you know within a company, the stronger relationship you’ll be able to build and the better chance you’ll have that that relationship will continue if your main contact leaves the company. Rule 7: Add value to those donations. Give your donors value beyond the tax benefits they receive. Offer specifics on where their donations went and how your organization used them. Give them as much personal connection as you can to the good their donation is doing. Taking the time to do that is the best way to turn that one-time donor into a long-term giver. If you are tasked with finding a good online giving service for your nonprofit, you will quickly realize that under the surface, online giving is not as simple as the sales sites might lead you to believe. What might seem like a good rate might in fact be a tiered rate your actual donations may not qualify for. The sales site may look nothing like the product itself. And the actual experience of donors is often overlooked amidst all the bulleted lists of features, options, and glowing promises. Fortunately, in the maze of online giving, there’s a place nonprofits can turn to for help. Consider the OnlineGivingGuide.com your tour guide for the online giving universe. Filled with humorous cartoons and cutting insight, it lays out the features shoppers should seek in a service—and offers cautionary tips on the deceptive practices some platforms use. There are innumerable options when it comes to selecting an online giving site. 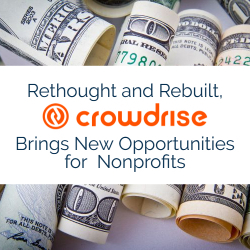 From industry giants such as Blackbaud and the various online properties of Ministry Brands (like easyTithe, eGiving.com, and Kindrid) to innovative competitors like Givingtools.com, nonprofits have an assortment of electronic giving platforms to choose from. How can you find the one that’s right for your nonprofit? The sales site: Don’t be fooled by aesthetically-pleasing online giving sites. After all, they’re often crafted by web design teams – not the folks who built the actual product. Look beyond a giving platform’s virtual appearance to ensure its modern look isn’t masking a terrible product. The interface: Experiment with a platform’s interface to test its capabilities across multiple platforms. It should work as flawlessly on a smartphone as it does on a desktop, and look nice on a variety of window and screen sizes. Can donors give to multiple appeals with a single checkout? Do they need a password before they give for the first time? The processor: This plays a significant role in determining an online giving service’s rates and features. Look for a processor with a strong track record of successfully securing and handling funds. Look for 0% ACH and flat, affordable credit card rates. Even better, look for system that is open and allows you to plug in the processor you prefer. Legitimate giving sites give potential clients an opportunity to try their services before committing to a product. With this in mind, shoppers are wise to engage in a trial run to determine whether a giving service’s features—and actual product experience—align with their needs. User friendliness: Navigate the site through the eyes of a donor looking to make a gift. Is this platform easy to use? Does it simplify the gift-giving process? If not, strike this option off your list. Ease of administration: Evaluate the site from an administrative perspective, too, to ensure you’re happy with the ways in which your company can manage the platform. Lingering issues: If questions arise as you demo a product, reach out to the company to have those inquiries addressed. This is the time to clear up any concerns or confusion you might have about a giving platform. Best to do this now before you—and your donors—are committed to a service you might not like. Online giving platforms offer a hefty return on investment. After all, the average online gift is $128. Moreover, online charity donations were expected to reach an astounding $31 billion last year. It’s a lucrative market, and one some online platforms are capitalizing on by charging hefty (sometimes hidden) costs and locking you in to a lengthy service term. For instance, Gofundme.com takes a five percent cut of donations, on top of a 2.9 percent processing fee. It also charges $0.30 per donation. When all is tallied, a charity using the service pockets less than $118 of that aforementioned $128 donation. OnlineGivingGuide.com offers a handy calculator that helps nonprofits determine the exact cost of using an online giving platform. The popularity of online giving is growing at record speed; its year-over-year growth reached 23 percent last year. But with the increasing popularity of online giving come venture-capital-backed companies looking to cash in on the new fashion. Indeed, some companies like Ministry Brands own numerous processors: you might think you are looking at two services when in fact you are looking at two limbs of the same conglomerate. When you’re shopping for an online giving platform, start with OnlineGivingGuide.com and follow the structured approach it presents. It’s rare to find an online resource this handy, humorous, and even-handed. Check it out today! GivingTools.com founder Jason Smith weighs in on online giving trends and challenges and reveals how his company is helping nonprofits get more for less. First off, tell us about your inspiration behind the launch of GivingTools.com, and why you felt there was a market for this type of site. After years of providing printed materials for capital campaigns, we created a system to deploy capital campaign websites. We figured if we launched a site with each campaign and referenced it in the printed materials, it would enable more effective printed communications and a flexible online resource that could adapt to the communication needs of the campaign. A real one-two punch. But more than simply securely collecting pledges online, we wanted to also offer an affordable way to collect payments. The problem was, with big gifts and recurring gifts, the existing model for online payments was just too expensive. 2.99 percent has been an accepted rule of thumb… and nonprofits are wisely unsure if they want a major gift to experience that kind of hit. So we did some research. What we discovered was that the cost of online processing is pretty negotiable and that online giving services were taking bigger chunks of nonprofit budgets than they needed to. We launched a solution that would accept gifts online from donor bank accounts for zero percent plus just $0.25. It was and is unheard of. We then launched GivingTools.com with a versatile online giving system that enables nonprofits to create many kinds of appeals: one-time gifts, recurring gifts, campaign pledges, product sales, events, and even volunteer signups. And we offered it all for just $14.95 per month. Four years in on the online giving product, the biggest problem we’ve had was people not believing our rates were so low! Online revenue for nonprofits continues to rise at a steady rate – it grew by 27 percent last year. Do you see traditional types of charity fundraisers (such as bake sales or walk-a-thons) going the way of the telephone booth? Not at all. Fundraising is about raising funds, sure, but it is about raising awareness and cultivating relationships. The Internet is a great thing, but it will never replace the effect of a real person physically representing a group to the community. People give to people for people. Social media is allowing nonprofits to reach an unprecedented number of online channels. What’s your best advice for charities seeking to implement a social media strategy? Remember that the goal of online social media is to be social. So, if you are going to tap into social media, use the medium to its fullest by maintaining an ongoing conversation with your supporters. Dedicate time every day to reaching out, not just through online channels but surprise people with a handwritten social note at a key point in their life, or pick up the phone and thank somebody. “Social media” is not just the Internet. That’s just one medium. Use all your social media—online, email, phone, direct mail, and face-to-face to connect with, thank, and listen to your supporters. The other thing I would say is to consider a news aggregator for your website. This is a way to display feeds from your various online social media accounts in one seamless stream. Pretty cool. What are some of the latest trends you’re seeing in the online giving world? A big trend is actually online giving outfits quietly being bought out by big conglomerates and turned into mere storefronts. The conglomerate homogenizes the core features and runs the gifts processing through one channel to maximize profits. Several very large outfits (Ministry Brands being one) are aggressively seeking to dominate the playing field. To them, it’s big business, with a lot of investors looking for a payout. Ministry Brands owns 25 brands and most nonprofits don’t know when they compare several services, they may be looking at just one service with several storefronts. Is it a good thing? Well, I’ll just say that some nonprofits ask me to assure them that I am not affiliated with Ministry Brands in any way before they will sign on. I am not sure what specific difficulties they may have experienced, but they feel pretty passionate about it. Some users have dubbed your GivingTools.com the Robin Hood of online giving. How did you earn that nickname, and do you feel it’s a suitable one? Huzzah! Well, we are not shy in standing up to the conglomerates and keeping more donations in the hands of the nonprofits. That’s where donors mean it to go, and we do our best to honor their wishes. For example, we offer that zero percent ACH rate. Just a $0.25 fee to process any amount from a donor’s bank account. Why can we offer it at zero percent? Because the wholesale price is zero percent. The conglomerates mark it up because they figure one percent will look pretty inexpensive beside a 2.99 percent cards rate, so they charge one percent. We refuse to take money like that. It just seems wrong. We also refuse to lock nonprofits into one processor. BluePay comes baked in to our product, but nonprofits can link in Stripe, Base Commerce, and even PayPal to do the processing. We don’t make a penny on processing, regardless of the processor. All we make is our monthly fee. Got that? We don’t make a penny on processing. That’s unheard of for an online giving company. And if that’s not Robin Hood-like, I don’t know what is. Many online giving sites take a significant cut of donations by charging processing fees. How is GivingTools.com able to avoid charging those same fees? Well, the processors charge fees. BluePay charges a flat 2.85 percent, for example. PayPal and Stripe charge 2.99 percent (or less if you negotiate). We don’t add a penny to that, we just charge a flat $14.95 monthly fee. It’s just a business decision. Nobody said you HAVE to profit everywhere you possibly can. Sometimes, a business can decide to give nonprofits a break. Aside from the obvious financial aspect, how do your minimal fees benefit charities? Donors want their gift to go to nonprofits…not to credit card processors. They like to know that the effect of their gift is maximized by low processing expenses. Now, from the nonprofit end of things, they want to do good in the world, and with more funding, they can do more. We were once told by a nonprofit that our low rates would enable them to save an additional child from homelessness each year. This stuff is not just about a bottom line. It is about people’s lives. Charities know that. Donors know that. We get it, too. When seeking an online giving website, what should a nonprofit look for in both the short and long term? I’d say that short-term and long-term, it needs to be affordable, to maximize gifts. The whole benefit of recurring giving, for example, is to reduce pledge attrition (missed payments). That averages about four percent of traditional donations. If an online giving service averages more than that, it is an expense. That brings me to the next criterion: ease-of-use. Beyond saving you money, an online giving service is a convenience to donors and to you. Is the interface easy on the eyes? Is it flexible to your needs? Is it intuitive? We’ve spent a lot of time refining our experience to minimize barriers to giving. We listen hard to our customers and we work every day to constantly improve our product. That’s a short-term benefit and a long-term commitment. On a personal level, tell us about your motivation for leading GivingTools.com, and helping charities get the most bang for their buck. It is simply thrilling to build a system that enables people to help people. I’ve been involved in charitable work most of my adult life, I’ve run for office in an impoverished city, worked with troubled kids. I’ve seen a lot of need out there, and I’ve seen a lot of committed nonprofits, struggling to make ends meet to help people in desperate need. This isn’t a job for me, it’s a mission. And finally, on a lighter note, we’ve noticed you’re having some fun with your site. (We love the roller skating Chihuahua!) Why did you decide to insert some personality into your page? Ah the Chihuahua. Well, I have this hunch that people like to smile. As they say: “If you aren’t having fun, you aren’t doing it right.” The animated Chihuahua scenes in the admin area of GivingTools help demonstrate product features in a fun and memorable way. At that point, we were “up Shih Tzu Creek without a poodle,” as it were, so we just stuck with it. The little guy has been an inspiration, really. I even find myself singing “Chihuahua wind beneath my wings!” some days. Is that normal? Jason N. Smith is founder of GivingTools.com. He has decades of experience in nonprofit fundraising and capital campaigns and is also owner of the multimedia firm, Fathom Studio. Based in Pennsylvania, he’s married with “innumerable” children. Every thriving nonprofit needs loyal, committed donors who feel like they are a part of your cause. And, in order to retain truly engaged donors, you need build personal relationships at scale. The problem is that building thousands of authentic personal relationships can seem almost impossible. After all, each relationship requires time, energy and resources from your already strapped team. Even though this task seems daunting, there is hope! The right types of data can give you the fuel you need to know your donors better, communicate with them on an individual level and ultimately grow giving. The secret weapon to building relationships at scale lies in three key data sources: social, financial and location. Here’s a look at how you can tap into this information to create sustained engagement around your cause. Last year, 81 percent of people in the U.S. had a social media profile. That number always seems stunning to me, but not surprising. The broad adoptions of social media allows your nonprofit to tap into a wealth of personal data on your donors. And with modern software, you can dynamically mine insights on your donors instead of having to manually comb through your social profiles one at a time. For example, let’s say you have a donor who’s been with you for three years and has given a gift to your organization around tax time every year. You want to understand her motivations and interests better, and are hoping to encourage her to give a little more (or a little more frequently). By reviewing the information she’s shared on Facebook and Twitter, you might learn that she’s on the board of several organizations, in a senior position at a Fortune 500 company and has a cousin who sits on your board. This one piece of data tells you she could be a great fit for recruiting corporate sponsors for your 10K fundraising event because of her personal and corporate connections. It also likely means she has a high net income and so you should avoid a $50/month recurring donation ask. A good CRM uses insights like these to give you recommendations about what kind of gift you can ask donors for, what events you should invite them to and how you can leverage their hobbies and interests to grow giving. Simply by unleashing algorithms that dig through social channels, you can learn about donors’ occupation and co-workers; interests and passions; friends and social connections; other organizations and networks relevant to your cause; and how supporters are related and connected to one another. Although you can get some idea of what income bracket a giver may fall into by knowing their job title and company name, you need deeper financial details in order to compel additional giving. For instance, every donor has a unique “giving capacity.” This means the maximum amount of money (or time) a person can comfortably give to your cause without breaking their budget. Best-in-class CRM software is able to combine your own historical financial data with data from third party wealth databases (real estate holdings, etc). From these analytics, you can gauge a person’s overall giving capacity, and identify if there’s a large gap between what they’ve donated and what they could donate. If there’s a significant gap, you’ll be able to use specific campaigns to target the donor and ask for more, knowing you’re not pushing them past what’s comfortable for them. Also based on this financial data, you can create forecasts around what giving might look like in the next few months, or years. This can give you the insight you need to stay the course you’re on (if predictions are positive) or switch up your tactics (if they’re negative). More data gives you more power to make the best decisions for your organization. A lot of times a donor’s physical location (home address, work, etc) can provide the most valuable insights into their giving behavior. 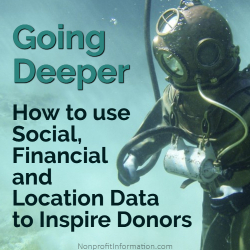 By leveraging geo-locations to figure out how givers are connected to one another (and to our organization) geographically, you can create a more complete picture of each individual donor. And by knowing where each person is located, you can offer them volunteer or participation opportunities that are relevant to them and more likely to be attended. Knowing which donors are clustered together in neighborhoods, around churches or near landmarks important to your cause helps quickly optimize fundraising. This is especially true if you can see what issues/campaigns drive giving in particular areas. Mapping donors helps target direct marketing efforts, determine event locations and identify your biggest evangelists for the cause. The amount of data available today can seem overwhelming. But when you are able to tap into the most relevant data… at exactly the right time… you can transform your fundraising. Going deeper into the social, financial and location details behind the people funding your organization can help you quickly build relationships at scale and create a profound impact on your success. This type of in-depth data helps you better personalize your communications, leaving the donor feeling known and appreciated – and leaving you with far better odds of getting larger, more frequent gifts. Online giving is growing at a record-breaking pace. Philanthropists donated more than $21 billion through online giving platforms last year, representing a year-over-year online donation growth of 12 percent. 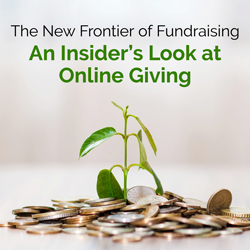 The online fundraising sector now represents nearly eight percent of the overall fundraising market. However, not everyone has been quick to hop on the bandwagon. For some small charities and nonprofit organizations, the prospect of raising money online can seem daunting. Fear not – we’re here to walk you through the process and help you navigate the world of online giving with confidence. As you look for an online giving solution that’s right for you, consider the following factors. They’ll ensure your campaign is reputable, low-cost and – most importantly – successful. In the nonprofit world, every donation counts. With this in mind, accounting teams would surely hate to see those precious pennies eaten up by numerous Mickey Mouse surcharges. Some big-name online giving platforms charge signup, fundraiser, and processing fees. It all adds up – YouCaring.com fees take an 18 percent cut from donations, while popular crowdfunding platform Gofundme.com fees account for about eight percent of each donation. That’s not all. That’s not all. Most popular crowdfunding sites charge an additional $.30 fee per donation. When budget-savvy nonprofits are searching for a place to raise money, they should choose a site with minimal fees and surcharges. Some services charge as little as $0.25 per gift, allowing nonprofits to stretch their dollars further. The site you choose to host your online fundraising efforts should do more than serve as a virtual collection plate. It should also be a place that builds a sense of community, bolsters donor loyalty, and inspires philanthropists to share your page with others. The most effective online fundraising campaigns are the culmination of community engagement, compelling multimedia elements, and strategically-executed marketing plans. Research shows that campaigns featuring personal videos raise 105 percent more donations, while teams that regularly updated followers raised 126 percent more money than those that provided no updates. Needless to say, your nonprofit’s fundraising site should support multimedia storytelling, offer multiple sharing tools, and allow your team to easily communicate with its supporters. Some sites—such as GivingTools.com—allow users to modify pages by choosing colors and themes that match their non-profit’s branding. Better still, online giving pages can be embedded into a charity’s actual website, simplifying the process for donors while bolstering a campaign’s legitimacy. Donations given on a branded donation form are statistically 38 percent larger than contributions given through a basic PayPal page. Moreover, supporters are about 70 percent more likely to make a second donation if their first contribution was made through a branded page. There’s an added bonus to running an online giving campaign through your own site: it will help boost overall traffic to your site, which has its own set of benefits. For starters, it can encourage visitors to spend more time exploring your site, which could ultimately lead to more long-term supporters and newsletter subscribers. 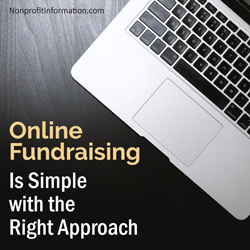 Once your fundraising page is established, you might wonder how to most effectively use your new online giving platform. Begin by developing a social media strategy, identifying your target audiences, and determining the resources you’ll need to execute your online campaign. Once your plan is in place, look to grow your social network and bolster your organization’s level of social engagement. After all, social media is only as effective as the size and liveliness of your base. When you begin seeking donations online, you should be targeting potential donors on multiple fronts. 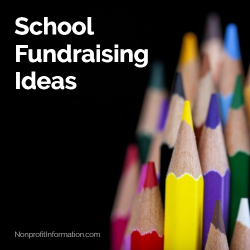 Begin by sending personalized emails, containing heartfelt messages and details about your fundraising goals. Continue building your campaign through social media platforms such as Facebook, Twitter and Instagram. Better still, consider using targeted Facebook ads to attract the attention of users who are linked to your email list. This will ensure an efficient ad buy. Here’s another trick: Before blasting your campaign on social media, set a goal and first approach close friends and supporters with donation requests. Studies show that people are more likely to donate to charities or causes that are close to meeting their fundraising targets. It also helps to create a sense of urgency by running a shorter campaign that last between 20 and 40 days. Online giving is fast becoming the new frontier of philanthropy – and for good reason. Charities and nonprofits that embrace this trend are likely to reach a wider network of donors, save money on printed materials, and see a higher return on investment. But remember: although big-name online giving giants such as indiegogo.com and gofundme.com are generating lots of buzz, they aren’t your only options. Take the time to find an online giving solution that’s right for you. A stand-alone capital campaign website is a great way to supplement printed campaign materials and expand the reach and effectiveness of your effort. The campaign website works alongside printed materials to broaden the reach and flexibility of campaign messaging. It also offers specialized functionality that makes raising funds easier. When you consider that a capital campaign often loses up to 4% of gifts due to unfulfilled pledges, online giving becomes an attractive tool for reducing attrition. But there is a right way and a wrong way to bring your campaign online. Just adding a section to your current site is not a wise move. 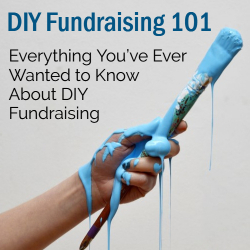 The features and functions required will overwhelm your normal site—and your potential donors. A stand-alone site tailored to the distinctive needs of a capital campaign is the way to go. Include an online presentation of your plan, expanded to include information that would not fit in the brochure: additional copy, project renderings, floorplans, etc. A progress bar shows your goal (and challenge goal) and tracks progress towards (and above) those benchmarks. The progress bar should be activated only after your campaign kickoff, to show early success. A good Q+A answers common questions and responds rapidly to questions that may arise through the campaign. This keeps misinformation in check and ensures there is no uncertainty in the minds of donors. This section provides planned giving information so that donors can consider creative giving options in addition to their cash pledge. A Resources section can also provide downloadable architect’s plans, a masterplan document, or other lengthy pdf files. A news feature enables you to keep the campaign fresh by going into depth on particular aspects of the effort and by providing testimonials from key individuals, announcements of campaign milestones, and more. Many of your visitors will like to read about your plans. Others will appreciate a video. This is a great way to bring your plans to life and can be shared via email and elsewhere. The venerable gifts table shows the sizes and numbers of gifts required to make your campaign a success. Bring the gifts table online. A calculator enables donors to see that they are capable of giving more than they might have guessed when the gift is broken into smaller payments. Donors can enter a total pledge and see how much would be given on an ongoing basis to meet that commitment. Alternately, they can enter what their payments might be and see what their gifts would add up to—the total pledge. Those little payments over 3-5 years can really add up. A secure pledge form enables recurring online giving so that donors can pay digitally on a recurring basis, dramatically reducing pledge attrition and enabling online giving to more than pay for itself. Mobile-friendly: Your site needs to be built using responsive design so that it functions on smaller devices and serves the 20-40% of your audience viewing it from a smartphone. Visually Consistent: While it is a different medium from printed materials, your site should share the same visual look and appear to be a natural extension of your other communications. Secure: The site must be hosted securely to keep sensitive data safe and to reassure donors that you take their privacy seriously. Easy to Update: A content management system allows administrators easy access to update the site and view gifts to keep the site fresh, keep campaign administrators informed, and reduce developer fees in the long run. Easy to Maintain: Could you cobble together a pile of WordPress plugins to get the function you need? Maybe. But over the life of the campaign (3-5 years), plugin updates will occur that cause conflicts and feature failures. Troubleshooting those can take many hours and can lead to a bad experience for donors. Try to fit the above content in your current website. Build a site from scratch that provides this function (will it be done before the campaign is over?). 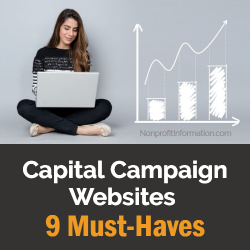 Partner with a resource that provides capital campaign websites. GivingTools provides a ready-made solution for capital campaign websites. Indeed, GivingTools is the only service that offers this. For a single fee (well under $1,000), GivingTools takes a pdf of your campaign materials and creates the entire site in just a few days. Secure hosting for 3-5 years is included at no extra cost. And if you want to allow online pledge payments, that can also be enabled, for just $14.95/month. That includes payments from banking accounts (ACH) for just 25 cents per payment…no percentages taken. 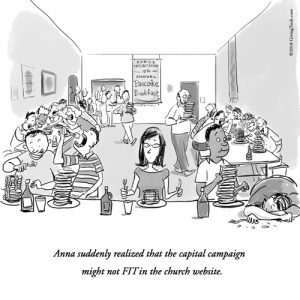 This resource makes creating your campaign site a piece of cake. You get a robust solution that meshes with your other communications and provides the convenience and power of online giving, all in a matter of a few days! By planning on a capital campaign site, your campaign brochure can be a compelling overview that leads people to the site for more details. If a donor loses a pledge card (or wishes to make an additional commitment), it is simply a click away. And with online giving, unfulfilled pledges (3-4% of total pledges) can be dramatically reduced. To see some examples of what a capital campaign site from GivingTools looks like, just visit givingtools.com. If done right, a dedicated capital campaign website can help maximize the success of your next capital effort. With the passage of the Tax Cuts and Jobs Act (TCJA) this year, nonprofits are steeling themselves for increased competition for decreased donations – an anticipated result of the change in charitable contribution deduction rules. Some nonprofits looking for an edge are exploring the option to accept cryptocurrency for donations. The most commonly referred to cryptocurrency is Bitcoin, but there are numerous currencies available. While adding this as an option for donors may increase the organization’s reach and its reputation for being on the leading edge, it comes with some cautions and important safeguards. Cryptocurrency values are highly volatile. For example, in February of this year, the value for Bitcoin reflected weekly returns of -10.4 percent and -6.1 percent before bouncing back with an increase of 29.1 percent, followed by -11.9 percent. That’s just four weeks of activity. There are many who are confident that cryptocurrency is here to stay, but at present, it seems that just as many believe that Bitcoin’s volatility is one of several indicators that the cryptocurrency is another “bubble” waiting to burst. Regardless of what the future holds, this volatility creates a strong argument for nonprofits that decide to accept Bitcoin to have a third-party processor in place to immediately convert cryptocurrency donations to cash. Even with its significant volatility, many people who have invested in cryptocurrency have become quite wealthy. According to Fortune Magazine (December 2017), a $100 investment in Bitcoin in 2010 was worth $28,341,266 as of December 2017. Many individuals who have profited from their cryptocurrency investments are looking for ways to support meaningful charitable causes while taking advantage of available tax deductions. Some organizations are choosing to use cryptocurrency donations as a strategic way to build and support technological innovation. For example, United Way Worldwide uses cryptocurrency donations to benefit their Innovation Fund. Other organizations accept cryptocurrency as donations to be used for the same overall mission and purposes as donations made with cash, credit card or stock. The Water Project was an early adopter among nonprofits and continues to accept and use cryptocurrency donations for their overall mission. 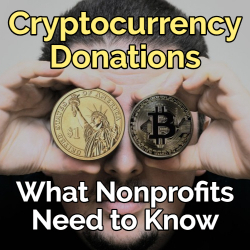 While an increasing number of nonprofits are accepting cryptocurrency donations, it is not a widely accepted practice. As such, nonprofits could still use this as a differentiator in their appeal to donors, as long as they recognize and protect themselves against the volatility and take time to fully understand what cryptocurrency is and how it works. As a differentiator, it should not take the place of mission-specific stories, outreach and other methods that have been successful in the past. While the focus of the IRS is on those who have directly invested in and reaped financial rewards from cryptocurrency, the long-term impact of the agency’s heightened engagement in this area could be a detriment to the appeal of cryptocurrency as an investment, the long-term wealth of cryptocurrency investors and ultimately nonprofits who may come to count on such donations. The caution? As always, don’t put all (or an overly significant) number of your donor eggs in one basket. As with any new approach to receiving and handling donations that may impact your nonprofit, it is wise to seek the advice and counsel of those who understand your organization, its resources and the options you’re exploring. The list of considerations presented above is limited and provides only a basic overview of some key considerations. To implement cryptocurrency options for donors, legal and accounting advice coupled with access to experienced third-party processors are critical. This new avenue for donors should be only one of many options your nonprofit explores as you seek to ensure you have the financial resources necessary to achieve your mission.